Need we any more evidence that the so called justice systems operating in the US, and elsewhere, are defunct and incompetent organizations? I can not help but be filled with indignation thinking of the countless millions of people who are harassed, imprisoned and enslaved by these bogus systems. As far as red pills go, this is a BIG ONE. One need not be a conspiracy buff to piece these data points together and conclude that something must be done. I don't have children, but I see the value in trying to make this world a better place for posterity. Please for the sake of humanity share this information widely. For more on the criminal nature of modern government see Criminals Impersonating Public Officers | The People MUST Stand Up And Take Down Illegitimate Government. And for other powerful information from Judge Anna von Reitz of Alaska click here. 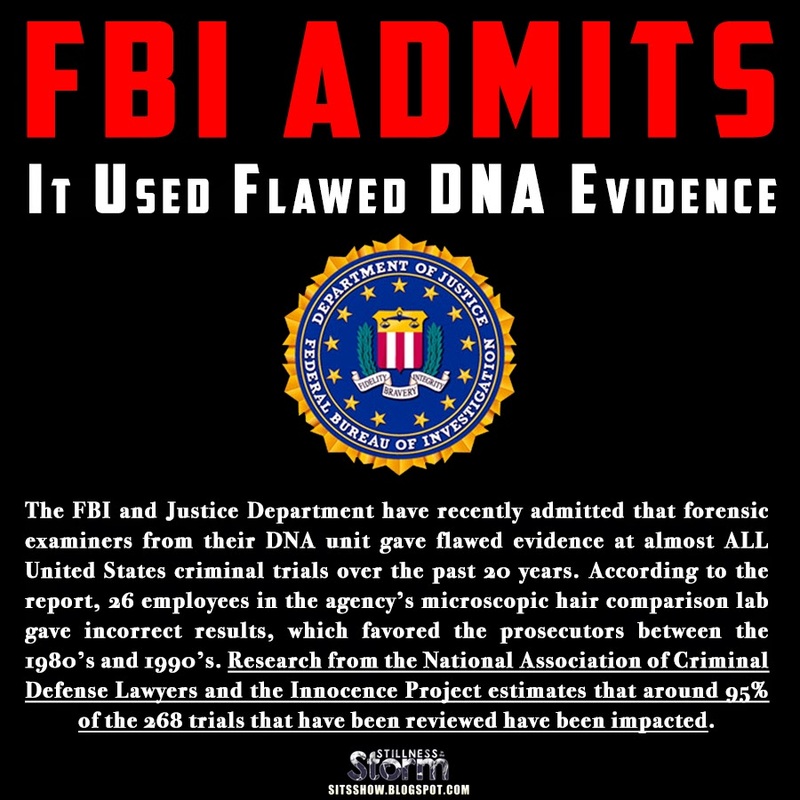 The FBI and Justice Department have recently admitted that forensic examiners from their DNA unit gave flawed evidence at almost ALL United States criminal trials over the past 20 years. According to the report, 26 employees in the agency’s microscopic hair comparison lab gave incorrect results, which favored the prosecutors between the 1980’s and 1990’s. Research from the National Association of Criminal Defense Lawyers and the Innocence Project estimates that around 95% of the 268 trials that have been reviewed have been impacted. According to The Washington Post, of the 200 convictions affected, 39 people were sentenced to death, and of those 39, 14 were executed or died behind bars. This does not mean that the FBI did not have other incriminating evidence against these so-called criminals, but that the use of forensics alone is certainly not enough to sentence any one of these convicts to prison. It most definitely does not provide enough justification to sentence them to die. What Did The FBI Have To Say About This? Unfortunately, a report from the department’s inspector general found that the FBI and Justice Department did not move as quickly as they should have to identify the cases that were mishandled by the 13 FBI crime lab examiners, meaning that some defendants were never notified that their convictions had been based on bad science. It has taken almost 5 years for the FBI to identify over 60 death-row defendants whose cases are now requiring further examination; during that time at least 3 have been executed. To me this whole ordeal is completely insane. How could so many people have been on board with essentially lying about the DNA samples? Were they paid off, or was it the pride of being able to say that they “solved” the case? This shows that sometimes we put too much trust in those who we believe are there to protect us and serve justice. What are your thoughts? Please share in the comments below!